Tonight is the new moon, both a few days after the Autumnal Equinox and a new year, if you celebrate Rosh Hashanah (and if you do, then שָׁנָה טוֹבָה to you!) I’m trying to slow down a little, and remember the sweetness of writing just for myself, for my own enjoyment – of living that way too, running my hair through with a little wooden comb, while sitting on a stone in my garden. Electric blue dragonflies hurtle past my head, and swarms of striped legged mosquitoes make a feast of my ankles. It’s officially autumn, but in Texas even late September is still thick and humid in the bright gold haze of afternoon that seems to go on and on. It’s finally getting cooler in the mornings and late at night now – a blessing to have the windows open and a slightly thicker coverlet. But even though the dress I’m wearing is patterned with autumn leaves, worn in honor of the turning of the year, it’s still made from light rayon – a short summer dress with the sleeves cut off, in russety fall colors. It’s stuck to my back with the sweat rolling down between my shoulder blades, because in this weather any kind of clothes just feel like too much. I’m wearing my favorite dark red knit knee socks and my old boots that I refuse to give up the ghost on, despite my pinky toes sticking out holes in the sides. It’s still too hot for this kind of footwear, but I’m stubborn because it’s FALL, dammit! And I WILL wear Fall things! My hair’s a wild tangle, a bird’s nest soup of knots and damp snarls. 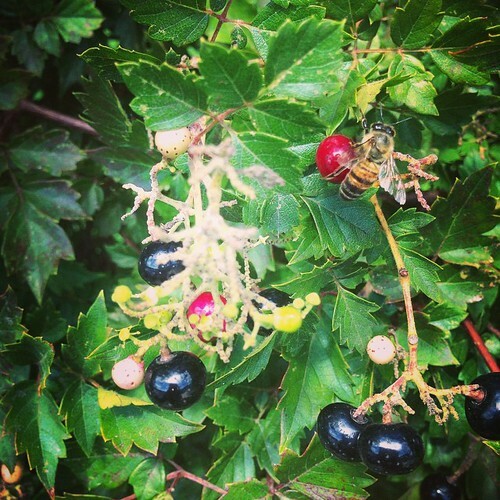 Whether I want to admit it or not, it’s still late summer in my world, and I will have to be a little hot for another week or so at least… It’s time to harvest the honey, to go hunting for mushrooms and ripe berries – elsewhere, anyway. Here and now for me, I know it’s time to take a breath and come back to magic, to come back to knowing. Time to feel the humming of the earth deep in your veins, and to sing that song back to the birds in the trees. The mockingbird in the front yard is happy the season is starting to change – the slightly cooler air makes her frisky and she sings happily from the yaupon holly tree all day long. The blackest berries are the sweetest. ☾ How Summer Ends… Paciencia, Paciencia This post is a year old, but I never stopped thinking about it. So gorgeous. Miss Patience really has a way with… Well, words, images, metals, hearts – she’s just amazing. I’ve been feeling frustrated and stifled the past few months, because I’ve fallen away from my rituals, my habits that bring me closer to the earth, closer to my circle, closer to myself. I’ve been traveling quite a lot, and it always seems to take me longer and longer to come back from orbit, for my soul to lodge back properly – I lose my rhythm, my daily routine is disrupted, and it requires an almost tedious period of reeling in, re-spooling where the thread has come unwound. Daily tasks like sweeping the floors, folding the linens, cooking the food, these all fall aside, and it takes a bit to return to the good ways. I think that kind of household task magic is essential ritual – especially for real harmony in home and heart. Blazing months passed by unrelentingly in the dog days of summer where my garden went unweeded and the zinnias started to droop, fall over and go to seed. My letters and emails piled up, personal deadlines floated on by, and all the words I had intended to get written still cluttered and clacked around the inside of my head. So, it feels sweet to bring myself back to a way of being, a way of doing, that I know deep down sustains me at a soul level. I’ve been hermitting terribly in the heat, and in the wake of the hustle and bustle and constant necessary human interaction that comes with long travel, and I’m sad to say that despite best intentions, I’ve been neglecting my friendships, most especially with my sistren, the women who I call sister. These are the ones that keep me anchored down to the root, the core of the earth – the ones who will say, “Let’s take tea, why don’t we?” or, “go outside and look at the moon!” or “Come and dance with me now!” I forget so often how essential their company and the reminders of what truly matters both are to my sense of well-being. I want to be honoring these relationships more in everyday life, but for now – because it’s late at night, too late for tea or dancing (though some of my sisters might disagree! ), I will dedicate this writing to all of them instead. Today, there are a couple in particular that I’ve been missing hard all summer: two strong women who always remind me how to live. Amy Annelle (Nelle) and I at Vintage Vivant a few years back. She performed with her band the Feedsack Shimmies in her feedsack dress, singing songs from the Great Depression. It’s pretty much impossible for me to describe how incredibly special this lady is, really – not if I want to do her any justice, anyway – so I’ll just say, if you’re not lucky enough to live down the river from her, to sit at her table for a meal, or huddle chatting and eating homemade cookies around her woodstove in winter, well then – I guess you better just go listen to her songs and be charmed by her fey ways. This post is dedicated to her most especially, in gratitude for all the ways she’s helped me and been there for me. I learn a lot of things from Nelle, but more than anything, she inspires me to be a better listener, and a better friend. I feel I mostly fail at those things, most of the time, but I do try. A lot of the articles in this post either came from her, or reminded me of her. If you’re reading this, Nelle – thank you! From one Polish would-be wise-woman to another. 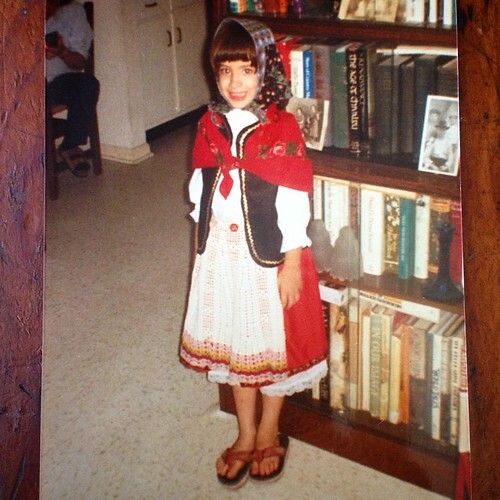 My mom dressed me up as “The Spirit of Poland” for a preschool pageant representing our various heritages. It was definitely from this moment that I acquired my passion for folk costume. Luckily, I later lost my taste for ugly flip flops, which I guess I insisted on wearing that day, much to my mother’s chagrin. Nell Racker (1846-1933) was a community midwife, herbalist, and spiritual healer. Bookstore treasures. 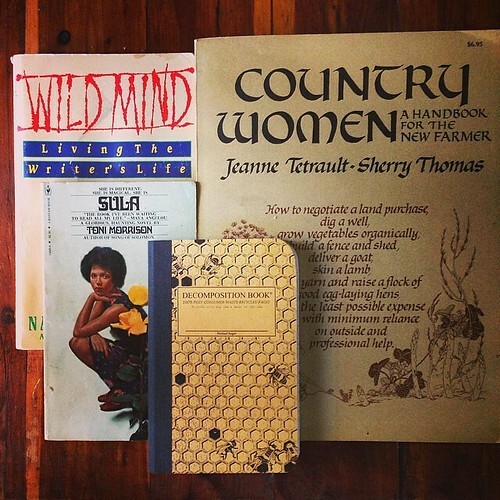 I was so happy to have finally found my own copy of Country Women. 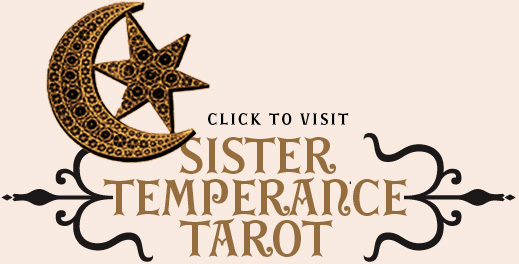 ☾ Do you know about the powerful work of the The 13 Grandmothers Council ? They are truly inspiring. “We are deeply concerned with the unprecedented destruction of our Mother Earth and the destruction of indigenous ways of life. We believe the teachings of our ancestors will light our way through an uncertain future. 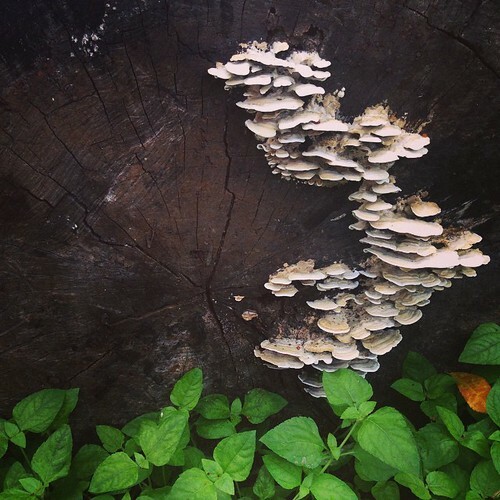 ☾ Meeting Medicinal Mushrooms with Sophia Rose from Female and Fungi – I’ve been meaning to share this tale of a fungal treasure hunt featuring my friend Sophia Rose of La Abeja Herbs – and here’s also a great recent feature and interview with her from Charm School Vintage. I had a really vivid dream about hanging out with Neko Case recently. It felt like it went on for hours and hours and we just talked about all kinds of stuff. I think we went to New Zealand, or maybe back to Colombia. It was great. You know those dreams that just feel real? You wake up and feel like you’ve really seen the person, spent real time – it was like that. I have been lucky to talk with her a few times, because she would come into Uncommon Objects when she was in town. One time, she did me a real good turn – I had just had major abdominal surgery, and though I was back at work, I couldn’t really stand up for long periods of time at that point, especially towards nighttime. She came in the day before her show to shop and asked if I was going to be at the concert. I told her sadly why I hadn’t bought tickets, and she told me she’d put me on the guestlist, and saved me a spot in the VIP balcony area so I could sit down and watch the show. So goddamn kind, that lady. I just cried happy tears through most of her songs that night. Thank you, Neko. I hope I get to do something nice for you one day! I made a mix of music to go with all this goodness, just for you! Please enjoy. EARTHWITCH from angeliska on 8tracks Radio. Artwork is from the book Wise Child (in my canon of most beloved magical YA fiction), by Monica Furlong. Cover illustration by my favorite book illustrator couple, Leo and Diane Dillon. Happy New Moon, dears! I’d love to hear about any little (or big!) rituals that have been helpful for grounding your spirit in these turning times, if you feel like sharing! Oh, Angel love! I am so honored to have found our portrait posted here among so many nourishing reflections and resources. I have so much to share with you about magical things I’ve been learning about but I feel shy about posting them publicly. We shall have to practice together one of these days in my neck of the woods or yours. I have been to Sapanta, Romania and to the very graveyard pictured here. Among some of my most precious photographs are ones taken at this graveyard. My old lover and I were there when we heard a dirge and saw a procession. We hid behind one of the painted wooden headstones and witnessed a funeral procession complete with a wailing widow. And the excerpt from Limits of Enchantment: I am lucky enough to finally be able to say that I get to do all of those things almost on a daily basis. I am creating the life that I want. I love you and miss you as always and confirm all of the lovely things you said about our Nellie. Our two weeks of hedge witch time was nourishing and precious indeed. I must make my way back to Austin to visit with ye sistren again as we grow into our strongest, bravest and actualizing selves. Big hearts, Angel baby. You have an open invitation to my shack in the woods for a retreat. Always, S.
I hear Estonian in this music mix! That makes my heart sing. Lovely woman, thank you for sending this along – four years after you had published, still fresh. Hearing your languor give way to the rhythm of ‘keeping house’ has something restorative, infrascopic, precisely held for the next letting-go.